For about $12, it was hard to pass up! I knew with some paint, it could be amazing! And I had seen something similar to it on Pinterest and thought it was pretty cool. So even if he thought I was crazy, I knew it could be a winner. Update: In hindsight, I should have used furniture paint (like chalk-based paint) or made my own DIY chalk paint so that I didn’t have to sand or prime, and so the paint would have stuck better. 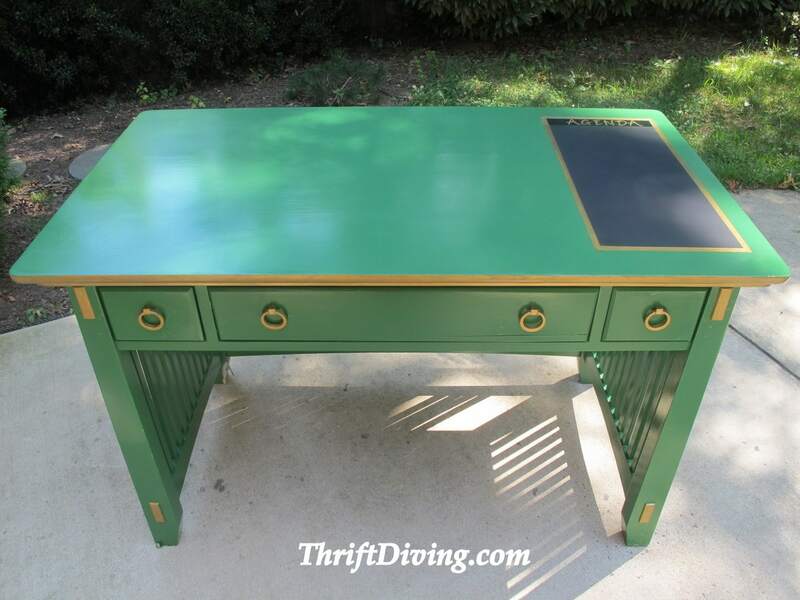 Over time, while my husband used this desk in his office, the paint became worn and “gummy,” despite me using a clear poly top-coat. So I recommend using a paint made specifically for furniture or finding a good DIY chalk paint recipe that can give you better results. Paint makes all the difference in the world! Pick the wrong paint, and you’ve got problems down the road (I’m speaking from experience!). Use one of these 12 chalk-based paints or find a DIY chalk paint recipe using Plaster of Paris or sanded grout if you decide to use regular latex paint. If you’re using a chalk-based paint, you won’t necessarily have to sand, as long as your furniture is in good condition and not all bumpy and “jacked” up. I did have to sand and prime mine since I was using the regular latex paint. Sometimes I like to use my paint sprayer for projects, especially if they have intricate details. 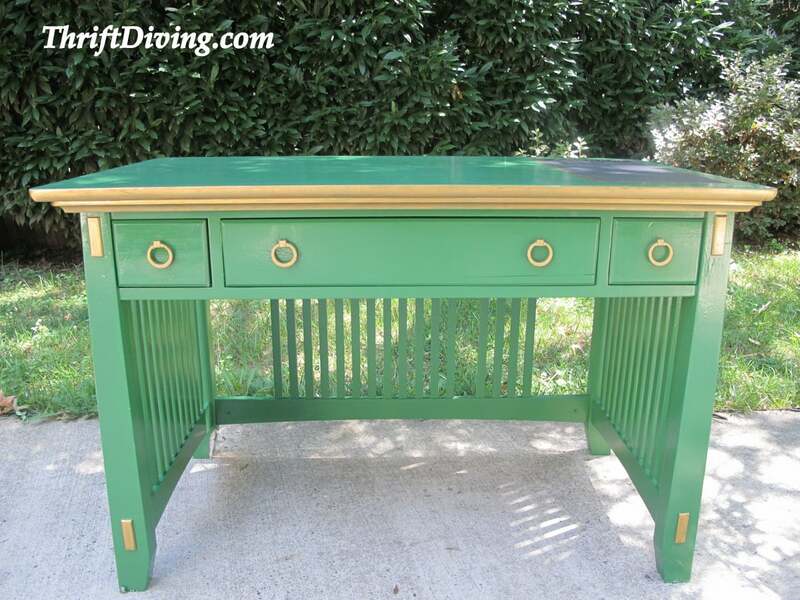 This desk had the wooden slats on the sides and back, and the paint sprayer made it really easy to use. Sorry, I didn’t get pics of it! But you can check out my video tutorial on how to use a paint sprayer! And to answer your question, yes, you can use chalk paint in a paint sprayer. For that tutorial, go check it out here. I love Frog Tape, so you should use that. It’s less likely to tear or to peel off your paint. But make sure the paint is dry before doing this part. Tape off the section you want to make your chalkboard. Then use the chalkboard spray to spray two coats to that area. I loooove the way gold Rub ‘n Buff accents edges of furniture! 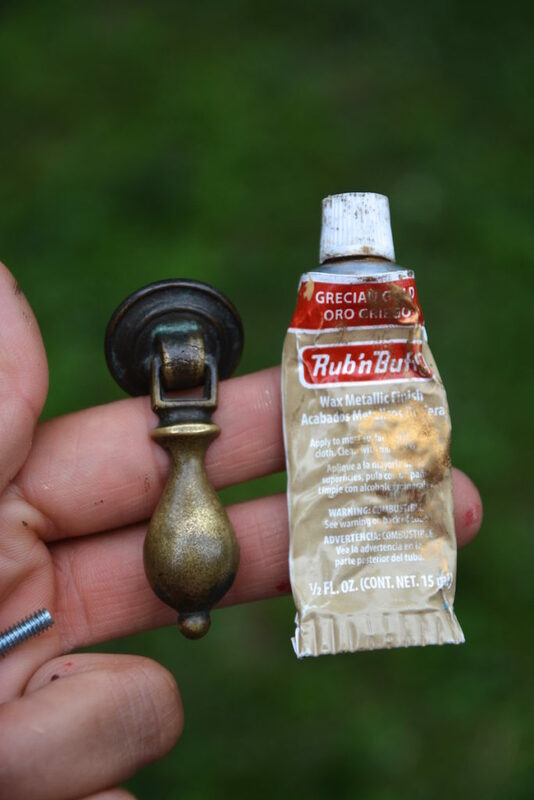 There are at least 5 ways to use Rub ‘n Buff, like on tarnished hardware and pulls. But another cool way is on the edge of furniture. 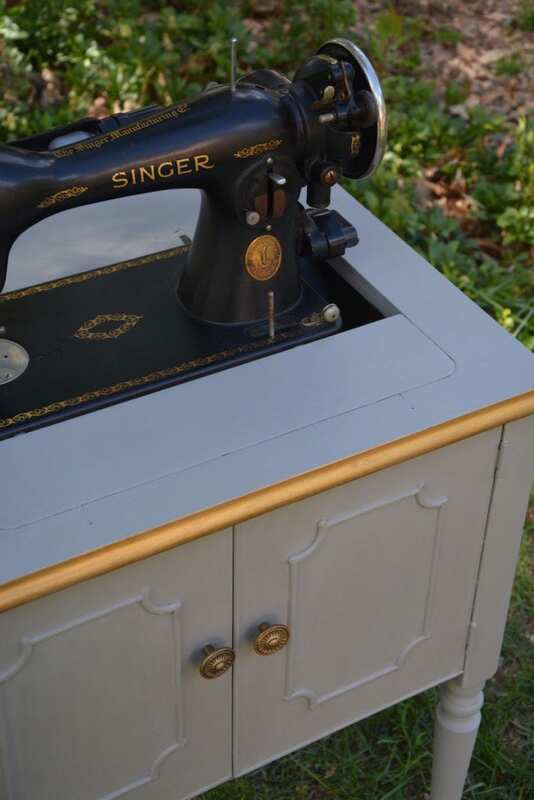 That’s what I did to this sewing cabinet makeover, and it looked great! I pretty much did the same thing with this office desk makeover, too! Just apply it with a rag, being careful not to get it on areas where you don’t want it to be. Use painter’s tape if you have to. You can buy Rub ‘n Buff for only a few dollars and get it in about 20 colors. Pretty cool stuff. after I applied them, I put a coat of the polyurethane on top of the stickers to protect them from prying little fingers (ahem–my children, LOL). I like using the water-based Minwax Polycrylics because it’s easy to clean. I want to run my brush under water and soap when I’m done–quick, simple cleanups, you know? My only tip here is to make sure that you don’t use Polycrylics on top of the light-colored paint. Even though it’s supposed to be non-yellowing, it does still turn whites yellow. So use it only on top of the darker paint. If you’re using chalk-based paint, you can either wax it with clear wax or use a paint that is self-sealing and doesn’t need wax. Check out my list of 12 best furniture paints for the comparison. I have been unable to get the pictures to come up, is it me?